MicroRNAs (miRNAs) are released in the blood as cell-free molecules either linked to Ago proteins and LDL or enveloped inside exosomes and microvescicles. The amount of specific circulating microRNAs has been discovered to change accordingly to a disease state and to be potentially used as a disease biomarker. 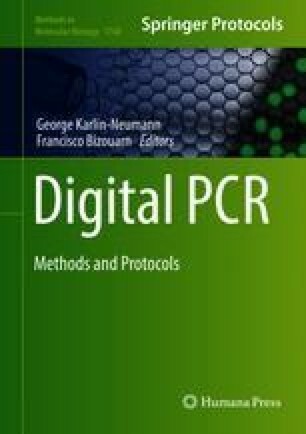 Sensitive and accurate methods for circulating microRNA quantification using probe-based or dye-based digital PCR technology have been developed. With a digital PCR system it is possible to obtain the absolute quantification of specific miRNAs, bypassing several issues related to low abundance targets and miRNA normalization. This chapter addresses the workflow and methods for miRNA assessment in biological fluids using EvaGreen-based droplet digital PCR as well as how to analyze and interpret results. The work was supported by funding from the Italian Association for Cancer Research (AIRC) to MF (MFAG 11676) and to MN (Special Program Molecular Clinical Oncology - 5 per mille n. 9980, 2010/15) and from the Italian Ministry of Instruction, University and Research FIRB 2011 (Project RBAPIIBYNP) and University of Ferrara (FAR 2012-14) to MN.